B-Club is a subsidiary of Bandai that focuses on special items including character figures, model detail sets, and full model kits. 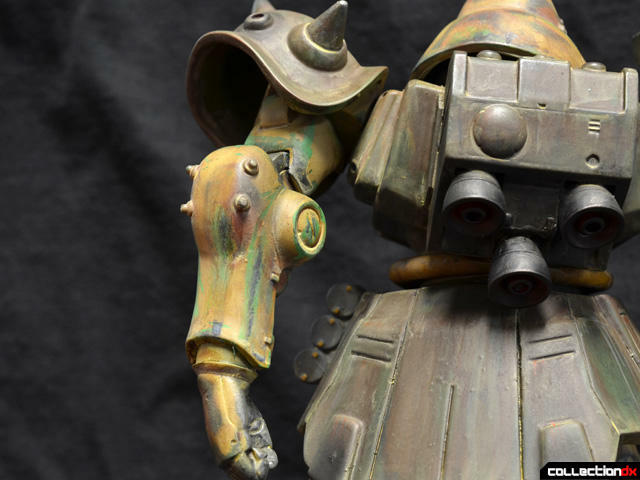 Their releases range from white metal and resin detail parts for Bandai plastic kits to reproduction Bullmark kaiju vinyl toys and PVC girly statues. When I learned that B-Club had released a line of 1/75 soft vinyl model kits of designs from Mobile Suit Gundam 0080: War in the Pocket, I was ecstatic. I'm not a huge fan of the miniseries, but I love robots and I love soft vinyl robot kits. I knew I had to start tracking them down. 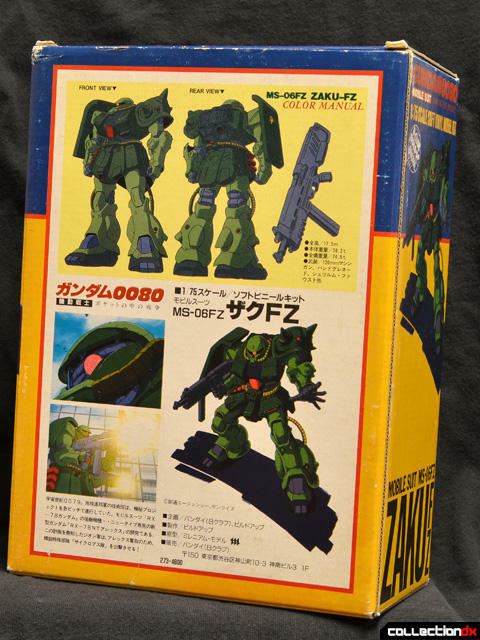 The first one I have been able to score is one of my favorite parts of 0080, the MS-06FZ Zaku II Kai. 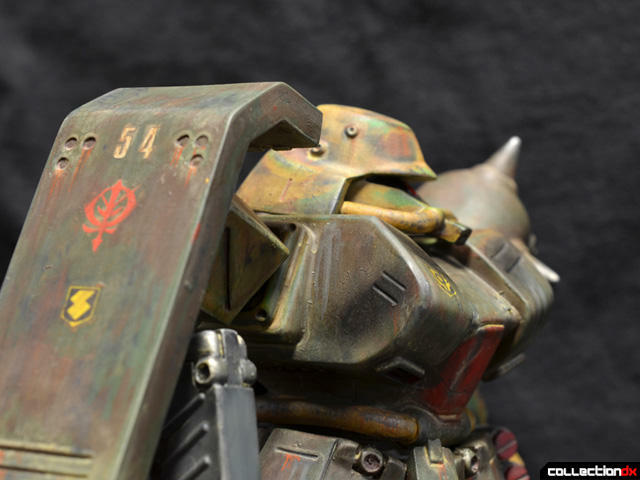 The B-Club Zaku FZ comes in a heavy cardboard box with gorgeous full-color printing. 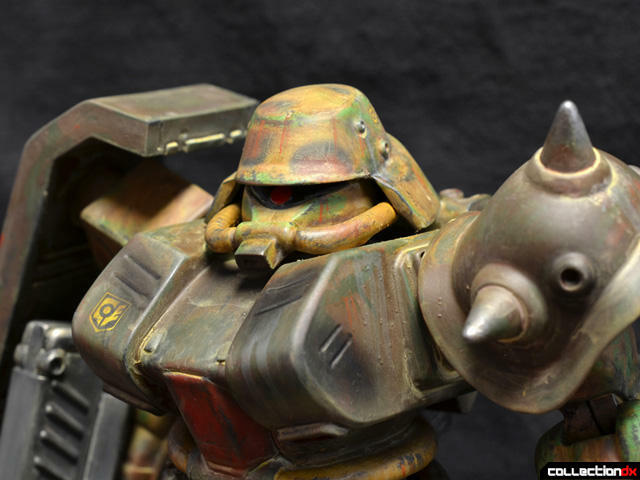 The artwork is classic hand-drawn mecha goodness. I'm not sure if the artwork is actually by the designer of the FZ, Yutaka Izubuchi, but it does the machine justice. Inside the box was a plastic bag containing a number of parts with vinyl flash that had to be removed. The best way to perform this task is to heat up the parts with warm water or a hair dryer, and work slowly with a brand new X-acto blade to cleanly remove the parts. Vinyl is a pain to putty and sand, so making clean cuts from the start makes life much easier. From there, assembly is a breeze. 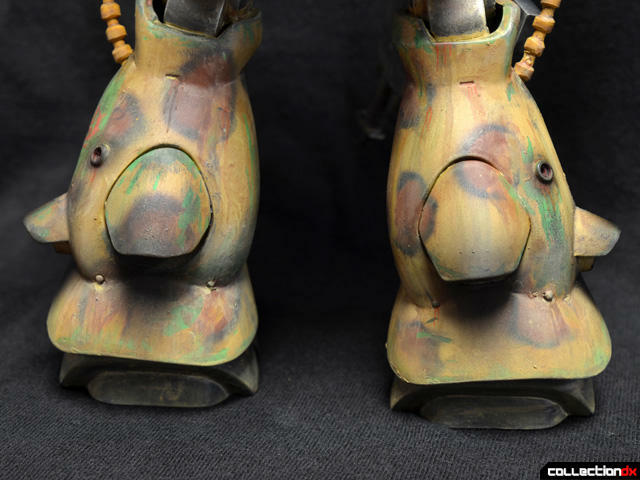 Most parts fit together like vinyl toys, with large collars fitting into holes and sockets that both make for secure connections and allow articulation. It's a simplistic solution, but it results in a very toy-like finished product. 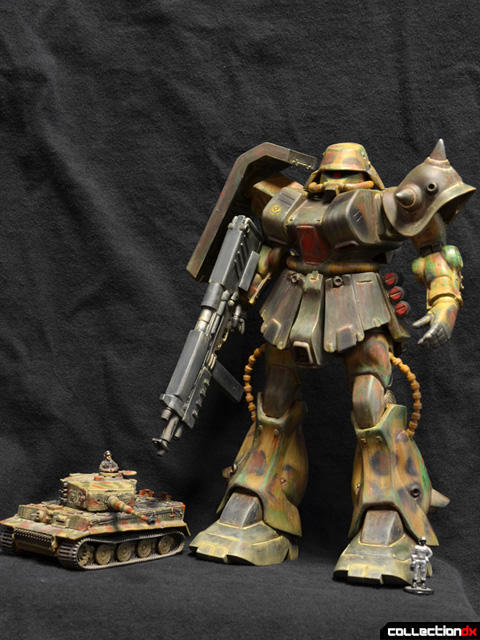 The kit includes multiple hands, and two head options (normal Zaku style head or helmeted version). 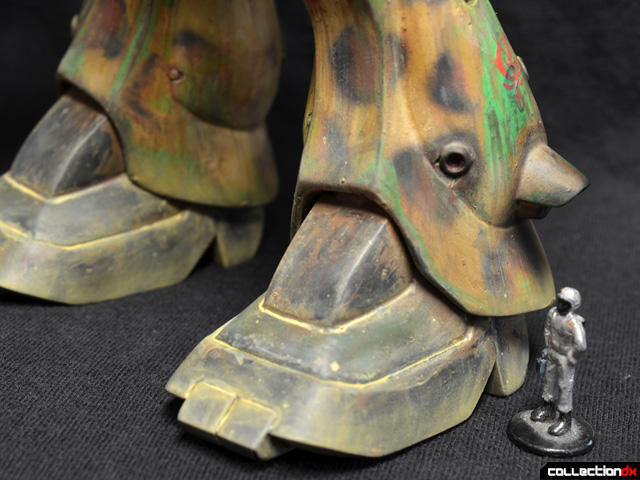 The completed kit stands around eight inches tall, shown against a Glyos figure. Since it is listed as 1/75 scale, I've also thrown in a comparison shot with my 1/72 Scaletiger and a 1/72 human, which are close enough for me. 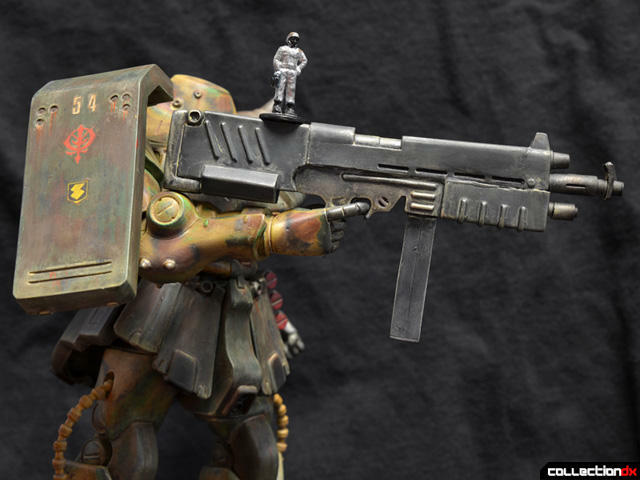 The vinyl mecha kit is a strange and wonderful concept. 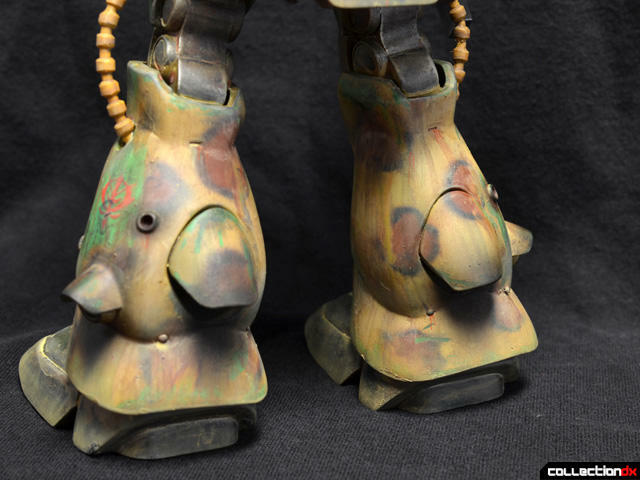 The best mecha designs are usually sharp, detailed, and highly refined. Vinyl kits, by comparison have a softer feel and heavier details with less finesse. The dichotomy makes for very unique renditions of mecha designs that I love. 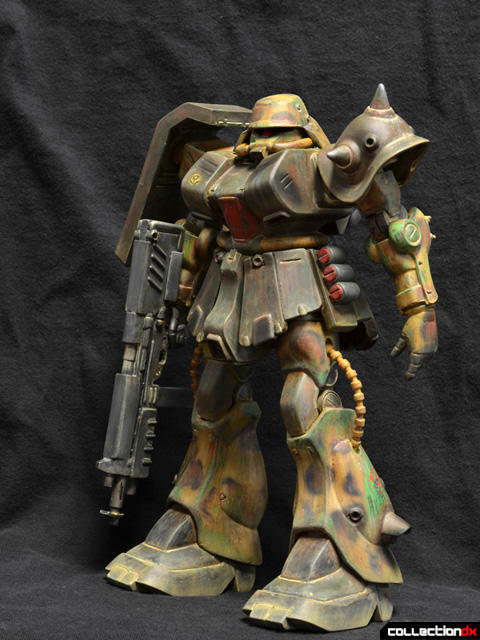 Soft vinyl kits are similar to resin kits in that they are typically handmade in small batches. 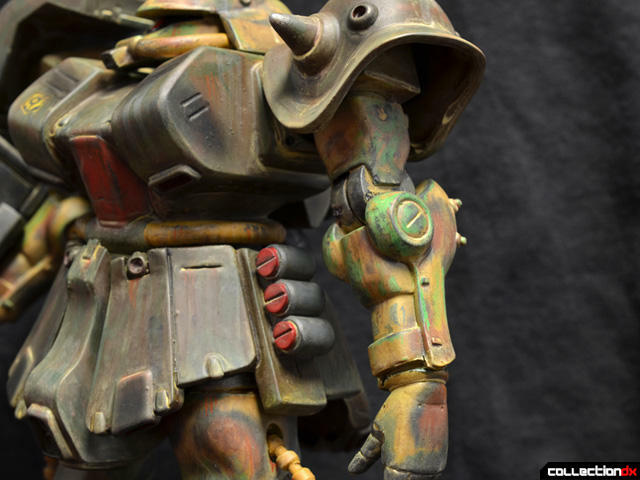 The process involved in making a soft vinyl kit requires a bit more effort than the typical resin garage kit, but is still accessible to the enterprising cottage industry kit maker. Soft vinyl is also used by larger companies as a cheaper material to make lower-run kits of less popular subjects that might not warrant an expensive injection plastic release. Sometimes, a subject is just better suited to a vinyl kit than plastic. Soft vinyl moldings have a very distinct nature. There is a certain heft to vinyl kits that makes them look and feel more solid than a plastic kit, but with softer and chunkier detail than something in resin. Designs with a lot of rounded surfaces benefit from being molded in soft vinyl. 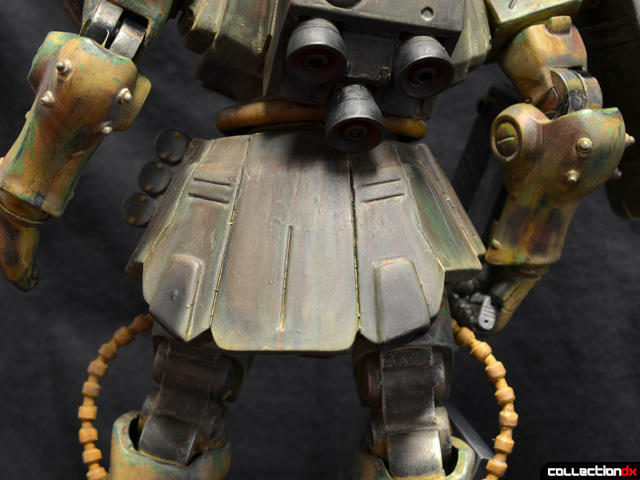 The Zaku II FZ is a perfect design for a chunky soft vinyl kit. The weird, bulbous spike shoulder and lower legs really benefit from the curves and heft that vinyl allows. 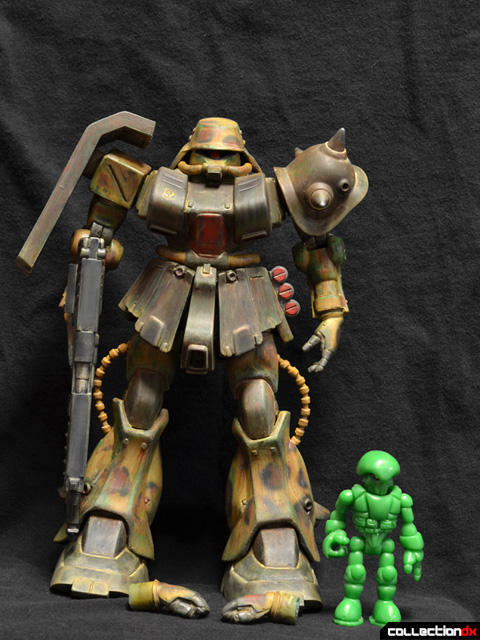 In resin, these parts would have been covered in seam lines, and in injection plastic the first Zaku II FZ kit was lean and flacid. Even the more recent HGUC kit is too trim and fit for me. In the animation, the FZ was very filled out in the chest and legs, and moved with a certain heft that only the vinyl kit captures. For this kit, I wanted to make the build completely out of the box, with one exception, and make the paint work the area where I modernized it a bit. In my mind, if you are going to build a vinyl robot kit, you should just follow the directions and see what happens. The best vinyl kits result in nearly indestructible figures with some articulation that can be handled and feel very toy-like. The Zaku II FZ kit mostly fits that bill, but has a few more parts that need to be glued than I was expecting. Such is the price the kit engineering pays for sharper detail. 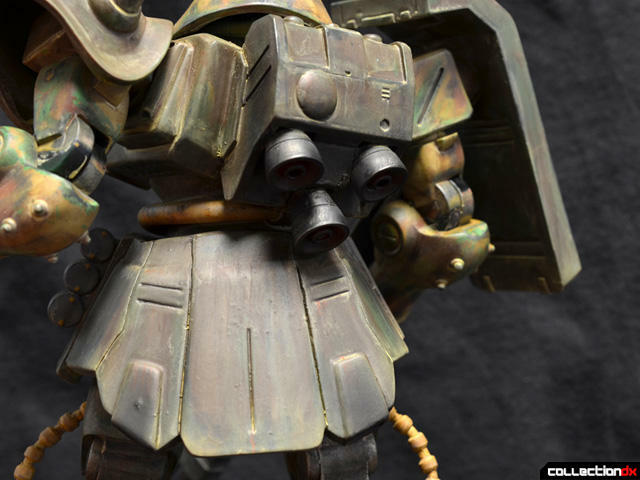 Parts that have to be glued include the spike shoulder armor, the large engine flaps on the calves, and the gun assembly. With proper treatment and strong glue, these parts can still be plenty strong. The only parts I modified were the leg hoses. The vinyl parts came on a large molding block, resulting in a segment of material missing on the inside of the curve. I did not want to have to fill and resculpt these sections, so I made some new tubes from plastic. Everything else is out of the box. One thing that really impressed me about the engineering of this kit was the elbows. 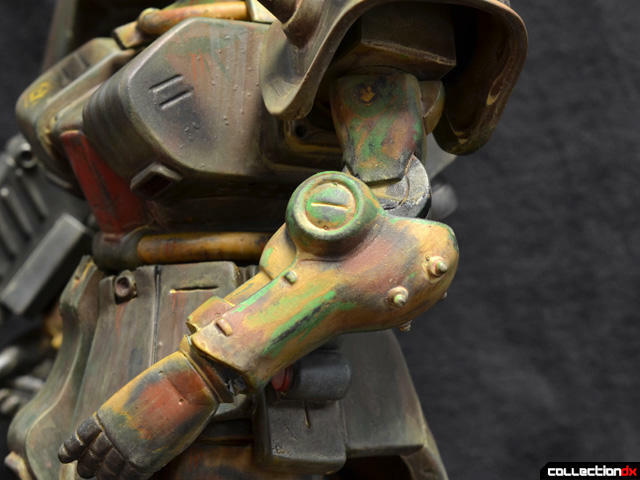 Most vinyl kits and toys only have rotation joints along where parts meet, but the elbows were actually engineered as a joint rather than just one solid arm piece. Half of the drum was part of the bicep, and half part of the forearm. A raised surface inside of one drum and tension provided by the armor of the forearm and bicep make for a swivel elbow joint. It's highly unconventional for a soft vinyl kit, but this kind of utilitarian problem solving is part of what I love about these kits. Vinyl as a material has numerous limitations, but intrepid designers find all manner of workarounds and creative solutions to add function and detail. 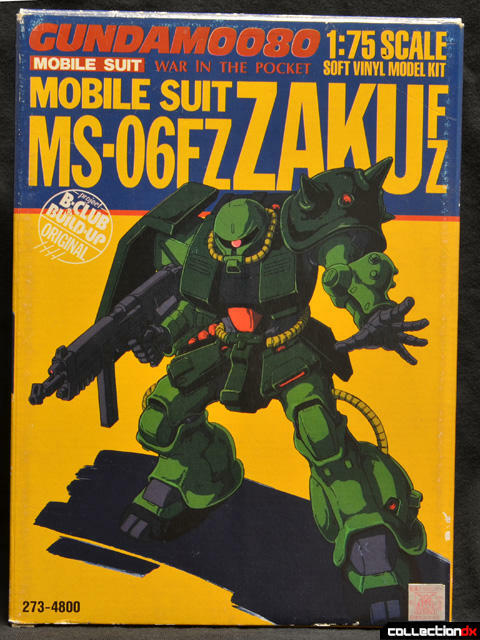 The obvious paint job would have been the funky hunter and olive green colors of the Zaku FZ, but that was not enough for me. I decided instead to depict a machine that had come off the factory in those colors and had later been painted in desert camouflage that had been worn back down to the original paint after use and neglect. To accomplish this layered effect, I painted the model in two stages. The first round was to paint the model in greens using Monster Kolor sealed with MK Gloss. Then, I painted on the desert camo scheme using acrylics. 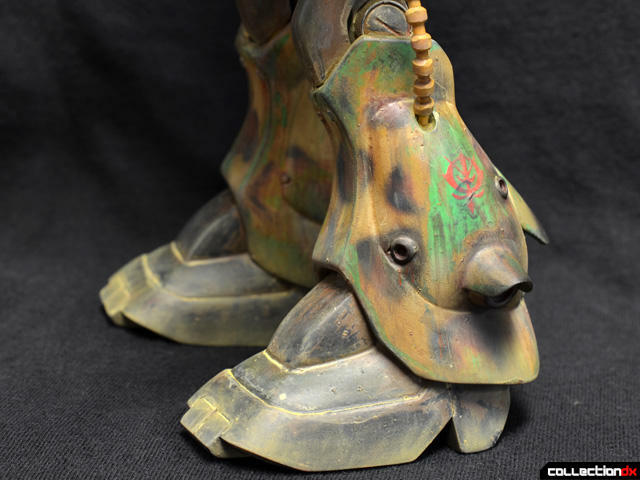 I wore down the acrylic layer using rubbing alcohol, which eats at the acrylic paint but has no effect on the underlying Monster Kolor layer, After that, weathering and detailing blended the two layers together. The decals were supplied in the kit, and I applied them under the MK Gloss coat so they would be protected and could be revealed under the camo. For being about twenty years old, they worked pretty well and were sharp enough for the abuse I submitted them to. It's not super articulated or sharply detailed like a modern plamo kit, but to me, this soft vinyl Zaku has much more soul and character than those modern, refined kits. The sculpt is chunky and not perfectly symmetrical. The details are crisp, but not razor sharp. 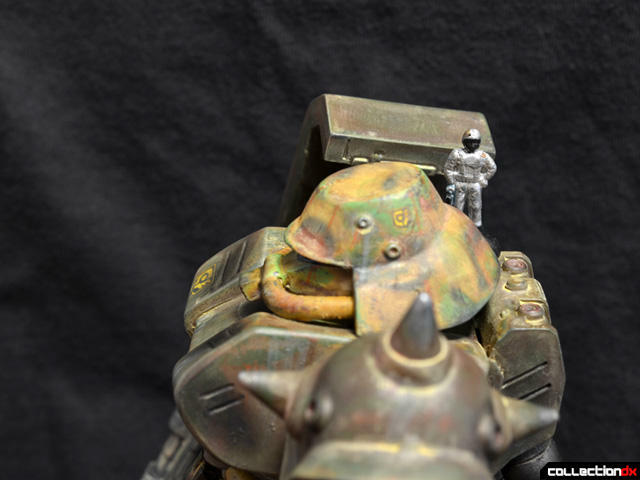 Everything has a heavy, bulky feel to it that adds weight to the finished robot. 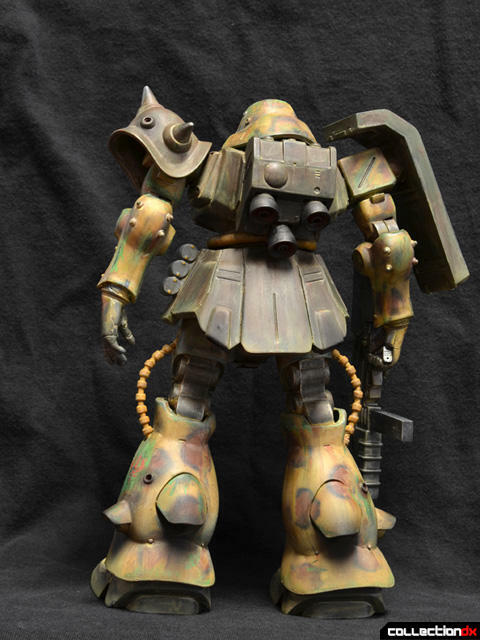 The B-Club Zaku II FZ is one of the nicest vinyl robot kits I have found so far, and I look forward to hunting down the rest of the line. Wow, this is phenomenal. 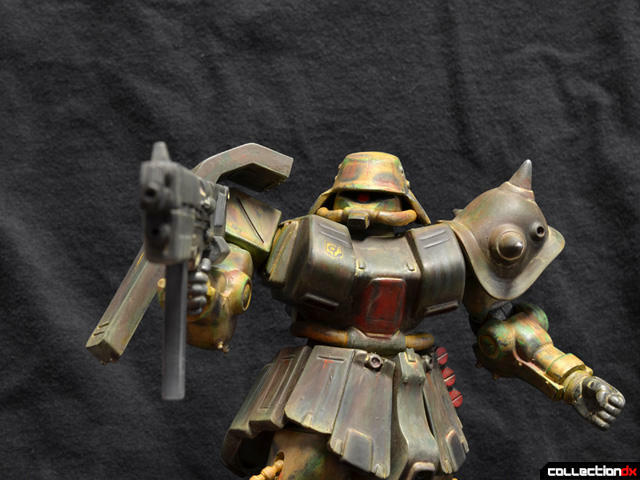 I at first thought this was the 3A Zaku toy! I would have liked to have seen some shots of it before assembly to see what one would get if they got this kit unpainted. Great work Ben! 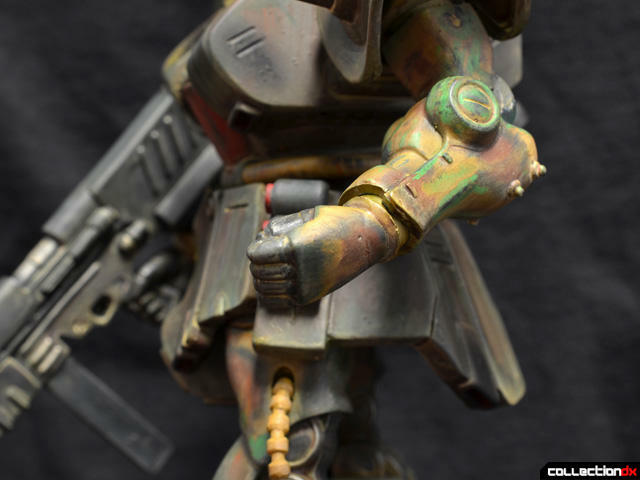 amazing paint finish and weathering on a great design. bravo! 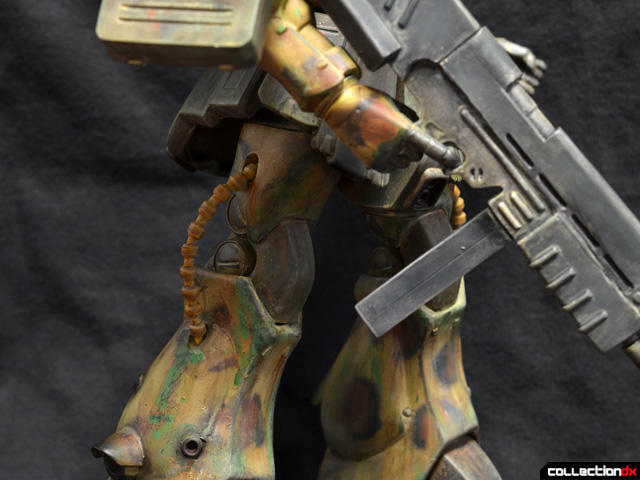 its nice to see weathering other than 3A rust patterns. very eye catching! Wow! Excellent job with the paint and finish, well done! Very unique paint job, you used a lot of different colors for this one. I agree B-Club has some interesting items and a whole other subculture in Gundam collecting. Thanks, guys! I had a lot of fun on this one and am really happy with the end figure. 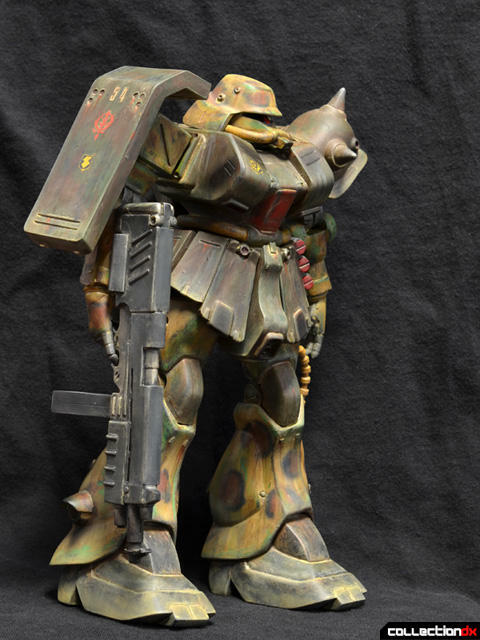 It's chunky and durable, and really captures the Zaku FZ look for me. Andrew, thanks for linking that unpainted pic that I totally forgot I posted. The unpainted green vinyl was such a gorgeous color I might have to find a second to leave like that. The only problem is that you cannot assembly the shield without using at least a little putty, since it comes in two parts and joints and the bend. Thanks, that is exactly what I was going for on this guy. I've done some weathered Gundam builds in the past and struggled to keep things in scale, so I made that a priority for this kit. I've really been practicing my fine detail work with some new brushes and paints, and am glad someone too notice! Ahhhhh, beautiful.....only the word came to my mind, first....!!! The proportion of the kit could look cute(!?) 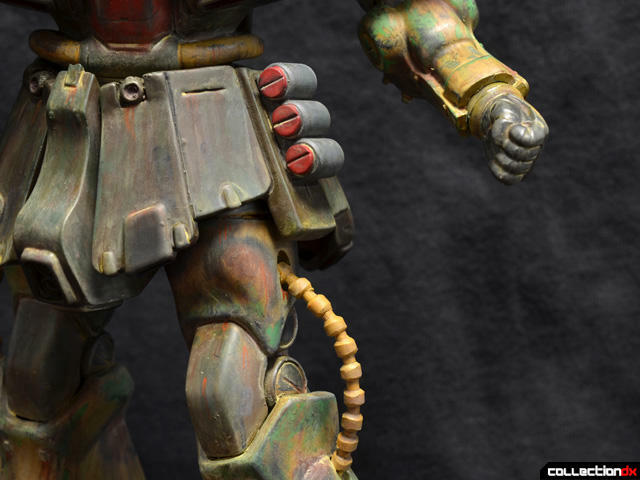 from today's point of view, but I believe that should be much better than HGUC Zaku-Kai.